Gepetto is a talented puppetmaker, but he really wants a son. Using the last of his money he makes a wonderful puppet and wish. 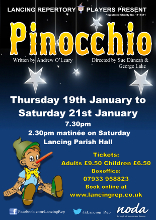 Now Pinocchio has to fulfil Gepetto’s wish, avoid temptation and become a real boy - Pantomime style!